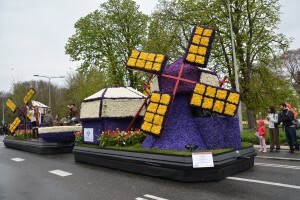 When the Camping and Caravan Club mooted the idea of a nine day “Springtime in Holland Escorted Tour”, taking in the famous Keukenhof Gardens and a street parade with flower-bedecked floats, we decided this would be for us. The venue was to be the excellent Camping Noordduinen next to the beach dunes of Katwijk in Holland. Day One, of the Tour saw us arriving and settling in amongst our fellow campers and meeting the very helpful and friendly Tour Leaders. As we were all pitched in the same area it didn’t take long to get acquainted. Day Two, was a day of slowly orientating ourselves in our new environment, for us it meant a stroll along the promenade to the delightful small town of Katwijk for provisions. After lunch, taken outside our van in the warm sunshine, most of our group were led by the ever smiling Cisco, our local guide and clubhouse host, on a very instructive walk to our adopted town. The first point of interest was of a large commemorative plaque with all the names of the town’s fishermen (and some boys) who had perished at sea over the years. As part of being occupied in the last war all the tall properties along the towns promenade were destroyed, so as not to restrict the occupying forces defensive view out to sea. The spin-off of this was when the time came to rebuild after the war the innovative Dutch took the blank canvas and only built two story dwellings and recently dug a huge carpark under the beach. So creating a modern, clean looking beach and promenade free from cars. 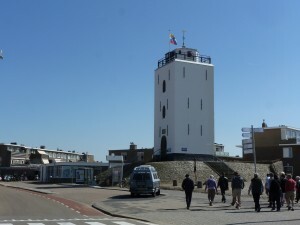 After a tasting of Dutch seafood of raw herring (not to everyone’s taste) and small pieces of fried cod at a beach side café, we climbed the steep stairs of the nearby old lighthouse. Now disused for its original purpose it acts as a Maritime Museum and houses fishing and boating memorabilia from Katwijks past, as well as given a great 360 degree view from its exposed walkway on top. Finally the guided walk took us through the old and interesting part of town before we all dawdled back to basecamp. Day Three, This was a free day to indulge our own activities. 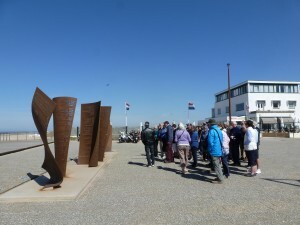 We opted for a return to Katwijk town to visit the large Museum, with free passes given to us from the campsite office. Housed in an historic villa in the centre of town it has been enlarged over the years and houses amongst the artefacts a large collection of paintings, mostly from the early 20th.century. Incorporated in the old museum is a mock-up of a Ship Owners Villa with its numerous rooms of the time. To guide you around the rooms, corridors and stairways you are given a talking handset (naturally in English) which was a mine of information. The huge models of fishing boats and objects of every-day life couldn’t help but transport your mind back to those harder times. Afterwards we enjoyed a delicious black coffee in the Hemma store, not unlike our M & S at home only generally cheaper prices, especially the children’s toys which we bought for our little granddaughters. The day was rounded off with an unexpected climax in the evening’s get-together over at the club. Our host Cisco organised a quiz, consisting of ten tables of 4/5 campers each with a team name, our team was called The Beckams. Well as Cisco went through the scores in reverse order we were beginning to think he had miss placed ours. When, after the usual long pause as heard (or rather not heard) on Strictly he called out, the winners are….. The Beckams, the creditability of new friends Tom & Sue reached new heights. 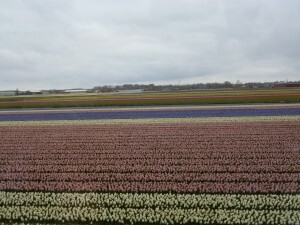 Day Four, Today was a full days programme starting with a scenic coach trip around the gloriously colourful bulb fields (they even seem to colour coordinate them) after which we were dropped off in old Amsterdam. 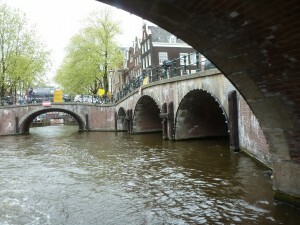 O ur first view of this bustling city was from the comfort of an included cruise along the water ways and canals with an instructive commentary over the provided ear phones. The waters sides were amass of moored boats of all description, small, large, some lived in, some converted into restaurants, some museums. It seemed like all factions of life existed on the cities water. 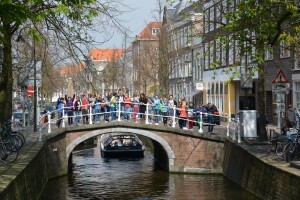 The tiny bridges we sailed under were thronged with people, some walking, some on bikes . All seemed happy. After this we were to explore the old part of Amsterdam on foot, people appeared very friendly, sometimes with scantily dressed ladies even waving for attention from behind their house windows, how pleasant. After a snack in an 18th.century waterside Irish style pub we amused ourselves drooling at the wares of the Chocolatiers and Patisseries amongst the narrow backstreets before reaching the city centre. Here a fairground was in full swing, probably in preparation for their Bank Holiday “Kings Day” in a few days. 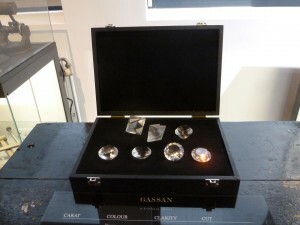 Then we met our group for a guided tour of Gassan’s the diamond merchants . 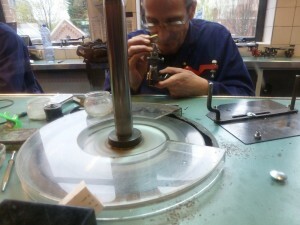 To see how small diamonds worth several tens of thousands of Euros were cut and polished was quite a privilege, alas no free samples. Day Five, was to be our day of taking in the sights and sounds of native Holland with a trip to the home of the Royal Blue Delft ware. The coach whisked us away at the start of another bright sunny day. After viewing more bulb fields we arrived at and enjoyed a drive-round tour of The Hague, buildings such as The European Court duly pointed out, before disembarking for a brief stroll round the huge central square of the Parliament buildings. 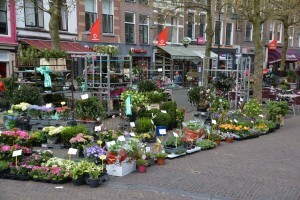 Next stop was Delft, we visited on market day and the place was awash with 150 market stalls, selling everything from clogs, cheeses, flowers, brightly coloured clothing as well all the more usual market merchandise. As you would expect in Delft every other shop around the edge of the market square sold “Blue Delft” ware, although the more basic and lower priced pieces were probably more orientally sourced than from Royal Delfts own factory. The quiet side streets with their little flower bedecked waterways made for our type of pleasant walking, while the occasional stop at a drinking hole for refreshments seemed the order of the day. 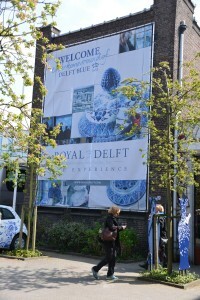 To round the day’s trip off in current flavour our coach then took us to the Royal Delft factory for their very informative tour. Not only were we shown how the figures, plates etc. were cast or moulded then fired on the shop floor, we then watched as a specialist painter applied various shades of grey through to black designs. After being fired again the dark paintwork changes to the more famous and recognisable drifts of blue. They also showed how the transfer applied patterns were a lot more economic to produce. Although all the in-factory wares were hand-made to some degree it still seemed rather expensive to a non-collector of true Blue Delft Ware. Day Six. 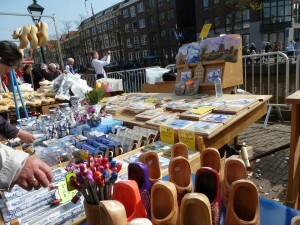 Our coach tour for today was to take in a variety of Dutch trades in addition to a Cheese Festival and market in old Alkmaar. 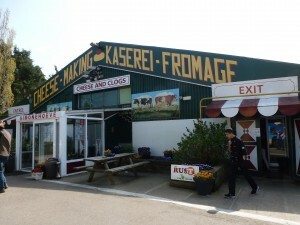 By the time our coach driver had made the usual touristy detour the Cheese Festival was in full swing. 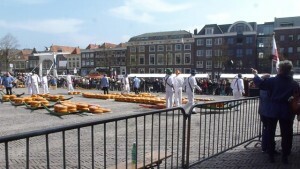 The general theme was of the cheese producers loading their large round cheeses in batches of about twenty on to trays that two men then carried to the weighing house. After which they were then sold. The market square was a mass of cheese related stalls, even the many towns canals had old working craft, their crews in traditional dress. Their barges were not unlike our native Thames Barges with their flat bottoms and Lee-boards to reduce their draft. 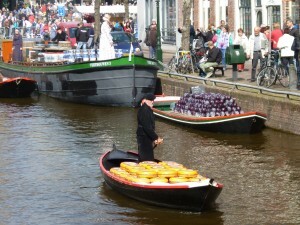 One odd thing we noticed was a few smaller open boats were stacked with cabbages, some all white, some all black. Maybe it depicted them being eaten with cheese. The town was really alive, noisy and colourful. The maze of small and narrow side streets were a joy to explore with their craft shops and food outlets. Again all too soon our magic carpet of a coach whisked us to a new experience, this time a Cheese and Clog Making Tourist Venue. 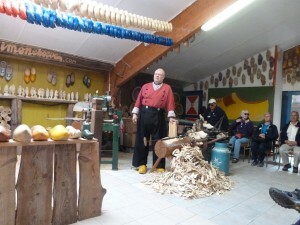 The cheese making consisted only of a talk by a traditional dressed lady but the clog making was the real thing. The humorous tradesman first showed us the old way by hand, (when asked for a volunteer to help I was press ganged by our leader, afterwards I was given a personalised engraved rough hewn clog as a memento), then by modern machines. When buying clogs the tip is get them two sizes up from normal with space for a finger between heel and clog, as your foot swells but the clog doesn’t. In the elaborate shop all things Dutch were for sale, we tried and bought some nettle cheese, different but rather pleasant. 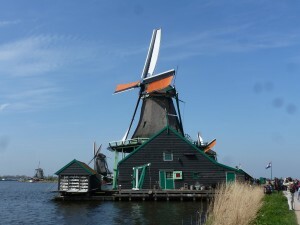 Onward with the coach tour, next to the tourist hotspot, Zaanse Schans just outside Amsterdam. 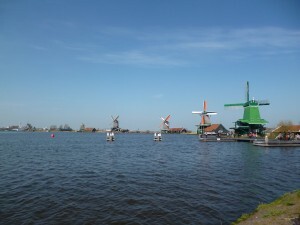 Here there are a cluster of historic working windmills, from saw mills, dyemill to oilmills. All open to the public, most for a small fee. 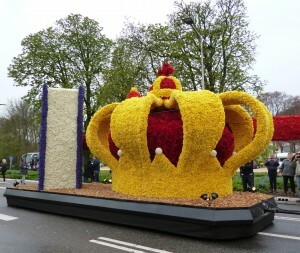 Day Seven, sadly leaden skies persisted for today’s famous street Flower Parade. 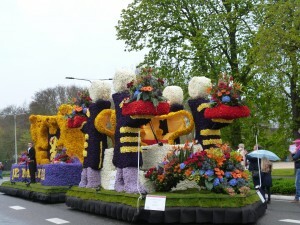 Starting at nearby Noorwijk and consisting of around 30/40 large and small floats the parade slowly makes its way along the coastal villages where the streets are lined with people. 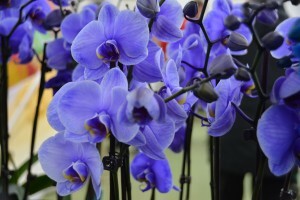 The hours of work that goes into producing these floral works of art must be tremendous. 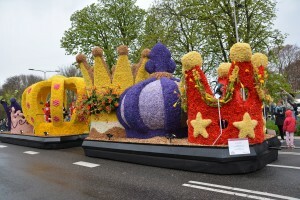 Some floats must have tens of thousands of Tulips and other stunning flowers. We were lucky to get kerbside viewing, so we had the added luxury of the heady scent of the huge colourful flower arrangements of horses, crowns, dinosaurs and many more. Worth the holiday just to see this. Once back on the campsite the group braved the elements and enjoyed an afternoon’s outdoor get together of drinks and tiffin and a game of Boules. 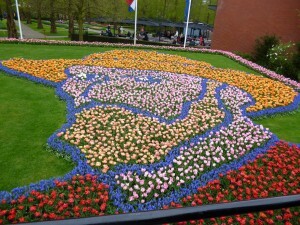 Day Eight, this was the climax of the tour, a full day spent at the renowned Keukenhof Gardens at nearby Lisse. Our coach got us there mid-morning so we enjoyed more than five hours of an intoxicating mix of colour and scents. 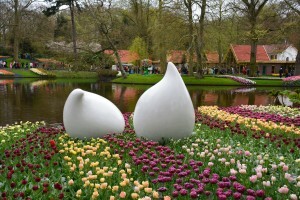 Set in seventy nine acres of undulating and watery grounds, using over eight million bulbs they have created a spectacular display. With an underlining theme depicting Vincent van Gogh, there were some interesting floral set pieces of him and his working life. 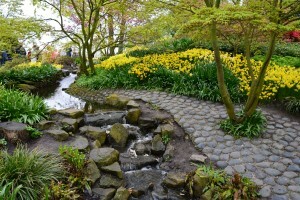 The drifts, borders, beds and banks of flowers were beautiful. 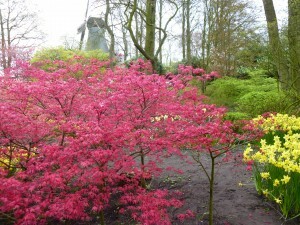 The skill on planting and arranging was obvious, being able to see between the trees to a spectacle of various colours blending with the tumbling streams was magical. The huge Orchid pavilion was a dream, in its centre was a r aised viewing area so you look down and out over the wonderful plants. 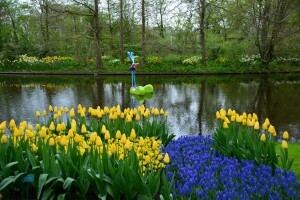 Words and pictures cannot do the gardens justice, only a visit can. In the evening we all met up for the final group meal in the sites modern restaurant. Day Nine, our last day on site. Expressed our thanks and goodbyes to Chris and Eve who were excellent Tour Leaders. After final farewells to new friends Tom and Sue we broke camp for our return. We now moved our van for the first time since joining the Tour and headed homeward. Posted in Holland | Comments Off on Dutch Spring Tour.